If you’ve spent any time in professional work settings or formal gatherings, you know that the rules for socks have changed. No longer are you limited to single, boring colors, and basic patterns. Dress socks with bright colors and patterns are in vogue. Wearing colorful dress socks demonstrates that you are no longer beholden to the rules of matching socks to the color of trousers, pants suits or full-length skirts. Socks don’t have to blend in; they can tastefully contrast the rest of your attire. 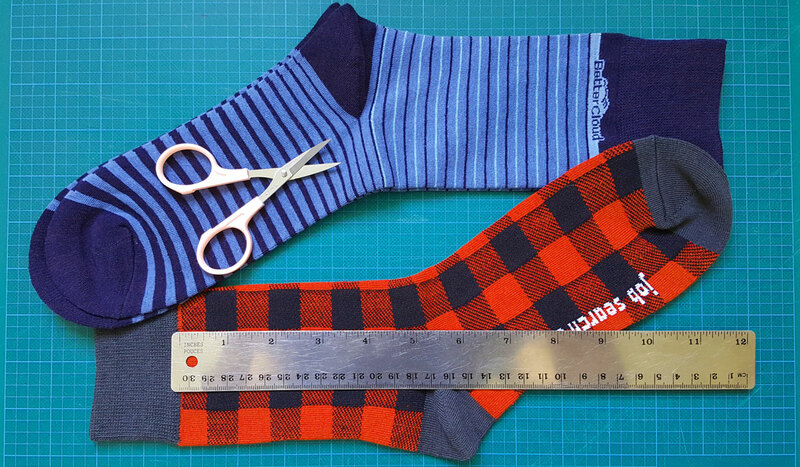 But even though there are now few rules for the type of socks you wear to the office, there are a few guidelines we recommend to ensure optimal appearance and manufacturability when designing your custom dress socks. No elaborate graphics in the cuff of the sock. The cuff is found on the very top of a sock. It is tempting to place a logo or other eye-catching graphic in this area because of its visibility. However, the cuff is also usually ribbed in appearance and stretchy. The ribbing will effectively hide certain details of logos, while the stretch tends to produce less than perfect knitting conditions for detailed logos. A simple logo or graphic can work in the cuff, but avoid putting anything intricate or complex in that part of your custom sock. No graphics in the heel or toe. These areas are where our knitting machines perform extra sequences in order to form pockets. Due to this, the machines are unable to perform knit-in designs in these areas. Use only solid colors for the heel and toe areas. There are limitations on the detail of graphics. Due to the nature of knit-in designs, very small and complex logos and designs are not suitable for custom knitted socks. We recommend avoiding designs that are overly detailed and busy in order to allow the knitting machines to better construct a sock with adequate stretch and fewer knitting imperfections. Limit the number of colors. Dress socks can be conspicuous, bright, stylish and attention-getting. They shouldn’t be gaudy. Therefore it’s best to limit how many colors you use in your custom sock design. We can accommodate up to six yarn colors in our custom dress socks. To help you design the perfect sock, EVERSOX offers an online template. For additional questions about sock design and color guidelines, feel free to contact us before starting your design.